Freecom USBCard Is Not Skinny Enough | OhGizmo! I don’t know about you, but a USB thumb drive is something I can’t survive without in this day and age. 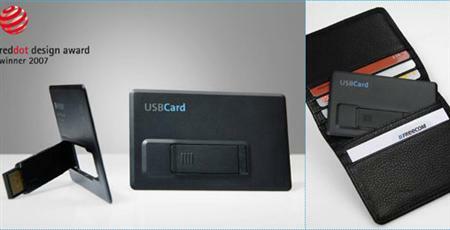 I carry mine everywhere, so you’d think I’d be excited by Freecom’s super slim USB card. Sure, we’ve seen credit card USB drives before, but USBCard is the slimmest yet, looking like it might actually fit in my already overstuffed wallet. So why am I not excited? Simple: it’s much more than it needs to be, specifically 4x bigger and 2x more expensive, at 70 Euros for only 4 gigs. There’s really no reason for flash drives to BE that big, since you can fit all of the necessary components in the space that’s taken up by the USBCard’s fold out connector. I could understand if they were using cheaper, lower density memory, but it costs double the going rate for flash. USBCard also comes with some encryption and built-in sync software, but overall I’m really not sure where that reddot design award comes from. And the fact that you could fit about 20 of the KingMax stooopidly small usb sticks into the same space.